Diamond studded square and marquis shapes accented in 14K white gold provide sparkle and contrast on this 14K yellow gold antique style wedding band. 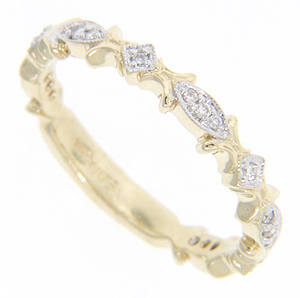 Additional yellow gold flourishes create interesting shapes on the ring’s edges. The wedding band measures 3mm in width. Size: 6 1/2. We can re-size.